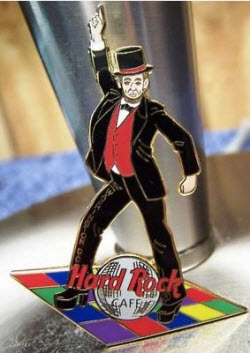 Here are some Lincoln collectibles from the Hard Rock Cafe: ever-popular pins. Disco Abe (pin 15137) is from 2002. It is a Limited Edition of 500 pins. 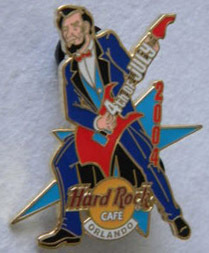 This 2012 pin from the Washington, D.C., Hard Rock Cafe is a bobblehead pin. Lincoln sits behind his drum kit; you can bobble his head. "If I were two-faced, would I be wearing this one?" <cymbal-crash!> This is a limited edition of 1000. Lincoln frequently appears with a guitar, sometimes seated at the Lincoln Memorial, and sometimes not. 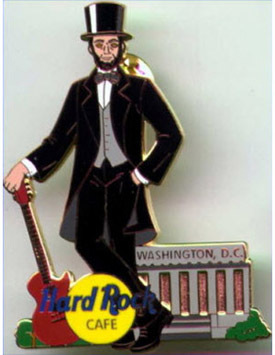 The 2002 pin (number 13886, LE 500) shows Lincoln standing outside the Lincoln Memorial with his orange electric guitar. The 2008 3D Monument Guitar - Lincoln Memorial Copper pin was a limited edition of only 50. 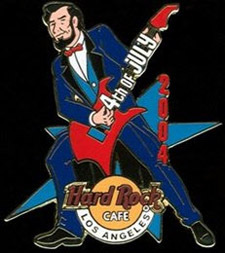 The 2011 pin takes the basic Lincoln line-drawing used on several Memorial pins and puts it against a blue stripped background. 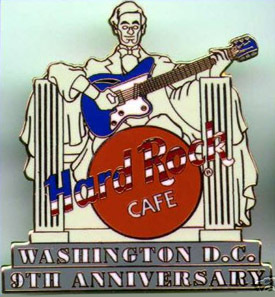 In the 1999, 9th Anniversary pin for the Hard Rock Cafe at Washington, D.C., Abraham Lincoln is seated at the Lincoln Memorial, playing his blue and white Fender Stratocaster guitar. This is a Limited Edition at 1000 pins. 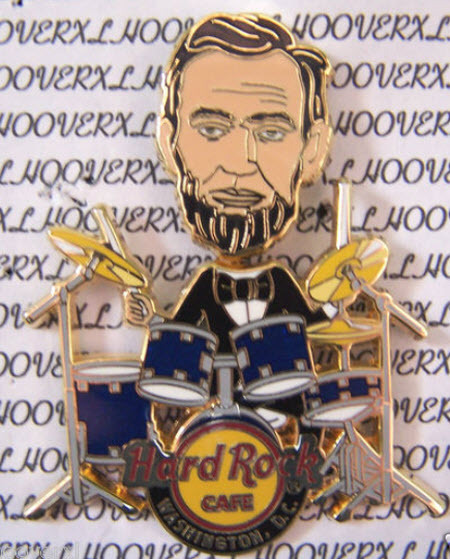 If you like bobblehead pins, you might also like the Hard Rock Cafe Lincoln drummer pin and the Hard Rock Cafe Abraham Lincoln bobblehead. Abraham Lincoln pins from this collection are identical except for the issuing Cafe. Pins in the set are from Phoenix (pin 23313), Los Angeles (pin 23413, LE 200), Detroit (pin 23449), Philadelphia (pin 23749), New Orleans (pin 23876, LE 300), and Orlando (pin 24109). Rock on! There's more! Did you know that the Hard Rock Casino has a $5 Abraham Lincoln casino chip? Click on the "View all # items on eBay" link above and you'll see a lot more items. The eBay finder above does not show items that are in eBay Stores. Copyright © 2005-2013 Alta Omnimedia. All Rights Reserved.